Fajitas are one of my favorite things in the world……I can’t even imagine anyone NOT liking them. Cheese, peppers, sour cream, cheese, chicken, cheese, guacamole….CHEESE!!!! And I sometimes even use the full fat version of everything!!!! Mmmmm….I love fajitas. So while I have never met a chicken or shrimp fajita I didn’t like…I’ve also never met anyone who doesn’t like these fajitas….welllllll..except my sister-in-law, Ann…who slathered hers in ketchup when I made them for her and my brother in law! 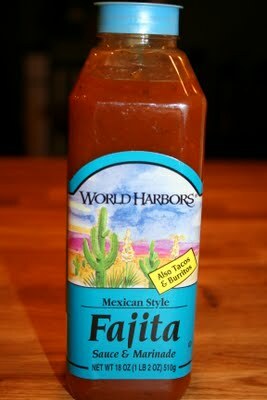 I don’t think I ever made her fajitas again……and I probably never will! 🙂 Her loss! These fajitas are so easy and so delicious, thanks to one special ingredient…the marinade! It’s all in the marinade and I’m not ashamed to admit it! Someone perfected a perfect (in my opinion) fajita marinade and WOW it’s great! When I make this I usually make extra so we have leftovers for lunch or another dinner. So I don’t have many measurements and I sometimes substitute shrimp and it’s equally delicious! I also love peppers and onions, so I go heavy on those! 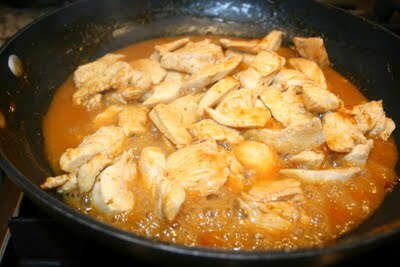 In a large pan add chicken and Fajita marinade and toss and cook until it’s done. Usually takes about 10 minutes. Wash and slice peppers and onions into strips. 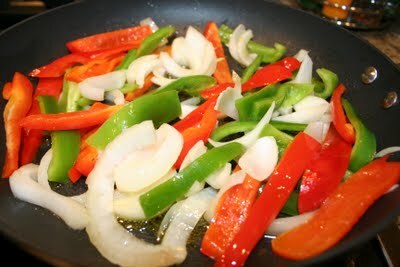 In another large frying pan add peppers, onions and olive oil. Just enough for sauteing. And cook those until done. “Done” for the peppers and onions is however you like them. I like mine cooked until still slightly crunchy. 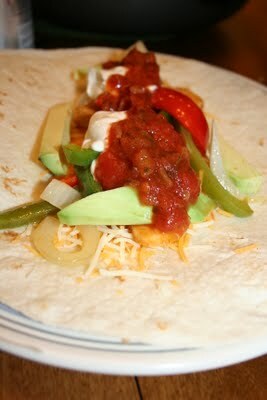 Fill (or stuff…like I do) your tortillas with all the yummy toppings, roll it up and ENJOY!!!! These are my second favorite foods. Especially made by you. I love that you posted this on your blog.